BridgeMojo is ACBL accredited bridge teacher Morris "Mojo" Jones, offering games and bridge classes for the greater Pasadena area and San Gabriel Valley. The Monday night BridgeMojo game is closed for now, but you can find a great non-Life Master game at the San Marino Bridge Club just down the street. While on sabbatical this year, I won't be offering any scheduled classes, but I am available for private lessons and small groups. Normally at this time of year I would be announcing my class and event schedule for the coming season. Jane and I have decided to pull the plugs on our day jobs. She's finishing up at the end of November at JPL, and I'm joining her from DreamWorks Animation at the end of February. It's a slightly scary and exciting thing to do. We've decided to take 2019 for ourselves. We want to have lots of unstructured time: take mid-week astronomy excursions to the desert, play tons of bridge, go to all the big tournaments, and listen to lots of live classical music and jazz. We're taking a sabbatical year with very few firm commitments. December 17 will be the last scheduled game for the BridgeMojo Monday night club. Let's make it a game and a party. I know that sounds like crazy talk. Just prior to Christmas, Jane and I made our first visit on a trek to out-of-town bridge clubs, researching what works and what doesn't. We played an open game on Christmas Eve at the In Tempo Bridge Club in Scottsdale, AZ. For those of us accustomed to smaller clubs, this one seems enormous! With very comfortable spacing between the tables, this former gymnasium was set up for a full sixty tables. It reminds me of the size of the InBetween club in Sarasota, FL, and I'm sure many of the other large Florida clubs are at least this size. Our game was a lightly-attended holiday game of sixteen tables. The top winners this month were Tor Hylbom and Richard Gero with 1.48, followed closely by Will and Ileana Shaw with 1.28. Come play at the Pasadena/San Gabriel Unit Game! The monthly Pasadena/San Gabriel Unit Game has been one of the best-attended and delightful bridge games in L.A. The finest players from the district drop in for a great free lunch and a relaxed Sunday afternoon of bridge. Indeed the field could be a bit intimidating for newer players, even with friendly opponents, but it's a wonderful way to improve your game and make new friends! The unit is now offering a separate game for players under 500 masterpoints — 499ers. It's the same great food, same great location, and even the same hands as the Open Pairs. The playing field is your peer group in bridge experience, with stratified scoring. Unit games award not quite as many (black) masterpoints as a sectional tournament, and way more than a regular club game. Hilary Clark and Rosemary Schroeder were the top winners (again!) this month with 1.26. Close behind was Angela Peters with 1.25. I'll remember September 2018 as the month when 110 folks came to the Laemmle in Pasadena to see a screening of the bridge documentary Double Dummy and meet the filmmaker John McAllister. :) Thank you all! Inside the club, Hilary Clark and Rosemary Schroeder were the top winners this month with 2.68, excluding their STaC overall award at 3rd in the conference. In the Western Conference STaC overalls, Dennis Burke and Ray Boncato had a big win to take the 0-750 tournament for Monday evening, earning 3.15 silver points for their win! Board 2 in the August 13 game raised an interesting bidding question. Last night on Board #2, South opened 1NT. As North, how do I reach 3-4♣? If 2♣ means Stayman, should I bid 3♣ with only 7HCP? I'm excited! I've arranged to present a screening of Double Dummy, a documentary about bridge by new filmmaker John McAllister. 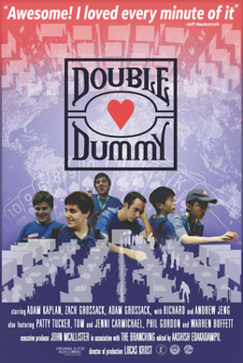 I'm presenting Double Dummy at Laemmle's Playhouse 7 in Pasadena on Sept. 18 at 7:30. Double Dummy introduces us to the world of bridge that we know and love, then takes us into the unfamiliar, exciting world of youth bridge. The film follows the adventures of several young players as they compete in the 2012 World Youth Bridge Team Championship, which the U.S. team had never won.